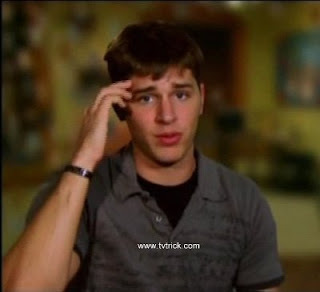 After exhibiting many seasons of drunken and loutish behavior from buffoons and tramps on the reality show The Real World, Bunim-Murray Productions was handed an opportunity with the story of cast member Ryan Conklin to transcend their previously embarrassing endeavors and create a memorable dramatic work. This they successfully and artfully accomplished with the production of Ryan's season, The Real World Brookln. In particular they used the crucial and climatic episode eleven to showcase an exquisitely intense synopsis of the situations that would make its final minutes such a dramatic tragedy, as well as reflect the season-long, well placed inclusions of all the events and sights and sounds that had foreshadowed that moment. It's true that the actual events of the story were not created and did not occur by any direction of the production company. Instead, production demonstrated its talent by recognizing that when the taping was done that the season was not the "story of eight strangers"; it was the story of one cast member, Ryan Conklin, and its focus would necessarily be on him. Equally important, there was the crafting throughout the season of appropriate editing and of emotionally charged devices that created an increasing sense of melancholy and dreadful anticipation of something terrible yet to come. All of this built towards the powerful and gut-wrenching pathos that came from a single phone call, the one that generated a profound effect on those who watched it playing on their screen. The foundation for success in telling someone's story is making people care about the character. Again, production didn't create the person, but they smartly didn't hold back on letting Ryan show who he is. They allowed him through his personality and strength of character to cause viewers to develop strong admiration and deep affection for him. The following are thoughts about episode eleven. For the 2008 Presidential election, Ryan stated his support for Barack Obama. He indicated that a major reason for that support was that Obama was committed to withdrawing American troops from Iraq and that is something very important to Ryan. It is not known what Ryan's views are on other current issues or where he would otherwise fall on the political spectrum. We do know that he has said that he voted for George Bush previously and that his home county went for McCain 59%-40%. Actually I'm glad I don't know what Ryan's politics are. It's always best to leave politics and religion out of the conversation to avoid ill will. Ryan finally showed his castmates his scrapbooks of pictures from his time in Iraq. It was reminiscent of Pedro Zamora also showing his scrapbooks, except Pedro showed his early on, while Ryan waited until near the end. It's not clear why Ryan would want to have held off showing them. Once he had told the others that he was a veteran it would seem like a natural thing to bring them out. He had talked about his experiences before and the scrapbooks would have been a good visual aid. It must be noted that the scrapbooks were methodically put together with various picture sizes, placements, and colored borders, which show off Ryan's creative streak. He never ceases to surprise. Ryan talked to Baya Voce about the showing of his film project at the New York Film Academy. He said his plans are to go to the University of Pittsburgh and there dual major in history and film studies. It's possible that his choice of Pittsburgh was in part because his girlfriend went there. Since he broke up with her, it doesn't seem so likely that Pitt is his choice. Ryan has said that he expects to move to New York City. For the screening of his short film, Baya, Chet Cannon, Scott Herman, JD Ordonez, and Sarah Rice came to see it and support Ryan. Ryan was confident that his film was good but he was a little nervous about how others would assess it. You could see the nervousness in his body language. He warned his guests that the film, "No More Tomorrow", would be dark in nature. He said he wanted to show something very different from his usual happy go lucky self. Ryan was certainly honest in his warning. The work was very disturbing with an ending showing its single character committing suicide with a gun. After seeing the film, JD wondered if Ryan was showing again some deep seated feelings that he felt he could only express by way of making this movie. 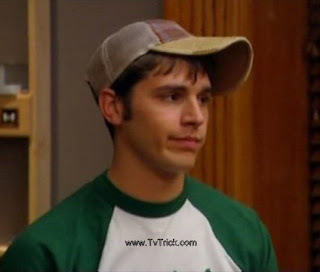 It was an excellent portrayal of a troubled person and Ryan's acting in it, especially the facial expressions during the gun scene, were spot on. Treating it as a work of fiction though, the real tragedy then became that Ryan's shower scene only showed him from the head up. Ryan was invited to an event sponsored by the Iraq Veterans Against The War. He invited only Scott to go with him. It's interesting that whenever Ryan talks with Scott it always sounds like someone talking with a good acquaintance, somewhat reserved. I think Ryan sees Scott as the adult in the group and he wants to try to act grown-up when he talks with Scott. In a flashback from when Ryan's brother Aaron came to visit, Ryan tells his brother that he is going to talk to someone about PTSD assessment. Aaron was glad to hear it as people back home had been talking about the need for Ryan to check it out. The good thing is that Ryan may be open to stop self-diagnosing and self-treating what can be a serious medical condition, if here were to have it. On election night, Ryan went to watch the returns at the gay & lesbian center while wearing patriotic Uncle Sam drag. The pant legs were too long as are most of his pants. I think he needs someone to measure and tell him his correct inseam. After the election was called for Obama he went outside and did some celebratory high stepping despite his bad knees (thanks to the temporary therapeutic effects of alcohol, i.e. "rheumatiz" medicine.) You knew he was going to pay for it the next day, and sure enough he was limping. At the IAVA gala Ryan Conklin got a big kiss from Katelynn Cusanelli, which was sweet. Ryan was dressed up in a nice dark suit and tie. It was much better than the brown one he wore previously with the fake mustache. He cleans up well. Very handsome. Then came the end and the terrible outcome that the season had been building up to. And with this sentence I can finally stop re-watching this episode and crying with every replay. In episode ten of The Real World Brooklyn, Ryan Conklin showed his leadership skills by organizing an event to raise social awareness. All of the RW cast were on his team to put the event together, so Ryan also got to show his ability to deal with a problem person on the team, specifically his friend Chet Cannon. He ended up with only so-so results for the event, but it was a good opportunity for viewers to see what a take charge guy Ryan is. 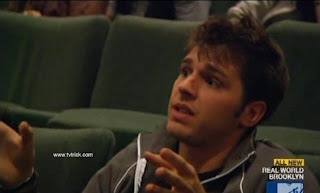 The adventure began when the cast was invited to a screening of the made for MTV movie Pedro. They watched the movie and then after the screening, Pete Griffin of Think MTV asked for their reactions and their familiarity with HIV/AIDS and sexual health. Ryan said, "Like where I'm from, people really think it's a big city issue, like AIDS, STDs. Living in a small town, a lot of people say, you know, not in this town. [But] you never know where people have been." Pete said that in the coming year MTV would launch an initiative to get every sexually active young person in America tested. He asked the roommates to put together a public screening of the movie, which would be coupled with a call to action for awareness and testing. Pete mentioned it would be ideal to have two of the RW roommates host the event. Chet grinned, immediately focusing on how an event that was supposed to be for the greater good and to help society could instead be used to help him personally work on his hosting career. There was a discussion among the roommates about who would best be able to connect with the audience and relay the message. Katelynn Cusanelli mentioned her experience in advocacy as perhaps a good consideration for her being a host. Chet gave as his reason for doing it that it fit his career ambition. Interestingly, Ryan gave his honest opinion that his best friend Chet would not be the right choice for the part. Ryan felt that a person who was not sexually active would be less able to relate to the audience and he said so to Chet's face. Ryan steadfastly believed that there is no compromising on integrity and that he had to do the right thing even if it momentarily hurt his friend's feeling. The roommates went home and Chet ranted in confessional that he could do a good job even though he didn't have any first hand experience. His point was valid that a person could teach about a subject with which they had no personal experience. But for Chet there would been other disqualifying factors, such as complete lack of compassion or empathy for any person (other than Ryan), his selfish motivation for "volunteering", and his inability to make normal connections with other human beings (again, other than Ryan). Chet went down to the gym to pout and Ryan, as the caring friend that he is, went to see what was wrong with him. About being shot down for the hosting gig, Chet confessed, "I'm not a sensitive individual, but that did hurt my feelings." It bothered him that a social awareness event could happen and with it the roommates wouldn't consider Chet's career goals first above all else. Ryan was somewhat disgusted by the self-centeredness (a.k.a as "narcissistic personality disorder") and left Chet alone. He had one final admonition for Chet, "Just keep one thing in mind. It's about the message, not our careers." Chet yelled back, "I know it's about the message!" Unfortunately, the message that Chet was referring to was "I'm Chet, it's all about me!" The roommates convened to plan strategy and the natural leadership skills of Ryan came out and he was able to organize everyone's efforts. Ryan was able to get the seven people who were frequently at odds all on the same page. Chet and JD Ordonez were tasked with getting a venue. It came down to using the theater at the New York Film Academy or showing the film at the LGBT Center. JD was in favor of the Center, but Ryan was adamant that it not be. Ryan asked Scott Herman, "How many of your friends would want to go to a gay, lesbian, bisexual center? A lot of people will look at our flier, and be like, 'ah, no, I'm not going there.'" Ryan had visited the center a number of times so the view he was expressing about not wanting to go there was not one he shared. It actually was okay for him to acknowledge that there is prejudice in the world, but with the cameras rolling he probably should have inserted a comment that he didn't condone it. He may have been a little too focused on being pragmatic and on the success of the project to think about the right way to say it. The event happened at the Academy without a hitch albeit with a very light turnout. It became clear that the location didn't increase the attendance. However since it was a stunt event, it's success was really from just getting the message televised on RW and on showing the commitment of most of the cast to that message. In episode nine of The Real World Brooklyn, Ryan Conklin didn't have any adventures of his own, so he was relegated to commenting on others. His roommate Chet Cannon always depended on Ryan for support and advice and he got some in this episode as did Ryan's gal pal, Baya Voce. One of Chet's problems is that he doesn't always know what the normal parameters are in ordinary society. This can cause him to carry things too far or to say or do things that are just not acceptable. When Ryan thinks it is appropriate or when it is possible to make a difference, he intervenes to keep Chet in check. Chet almost got in big trouble after talking to Katelynn Cusanelli about her vaginal stents. These are medical devices necessary for her to use for post-surgery dilation. Chet inappropriately asked Katelynn where she kept them, saying as a prank he wanted to hang them over someone's face while they slept. Ryan walked in and heard the word dilate and asked Chet what was meant by it. Chet explained it was used to plumb the depths of Katelynn's va-jay-jay and keep the passage wide open. Ryan's wasn't sure what it was all about but didn't want anything to do with it. Chet told Ryan his idea of using the stents for a prank. Ryan adamantly said, "No way. You're not going to touch them!" Ryan was able to see that the such a thing was intrusively sick and he made it clear in his order to Chet that it was not to happen. Ryan needs to continue to try to turn Chet away from being the sociopath that he is towards everyone except Ryan. Continuing with Chet, in this episode Atlantic Records took advantage of the RW cameras by agreeing to let Chet "interview" the group Danger Radio so that they could be seen on the show. It was kind of sad that Chet felt "accomplished" by it. He really didn't get the concept that Atlantic Records would have been just as happy having Scott Herman's water bottle interview the group if it would get them airtime. Later, Chet was invited to a club to watch Danger Radio perform. He brought Ryan along with him. After the performance the group talked to Chet and Ryan and Chet invited them back to the house. They agreed and the band and the roommates had an impromptu party. Ryan got the opportunity to sing his "1863" song for them and they and everyone of course enjoyed Ryan's work. At some other time, Chet needed a head shot, which JD Ordonez agreed to take. Ryan provided posing advice to Chet and was asked by Chet for inspiration. Ryan gave "inspiration" by pulling down the back of his pants, exposing his surprisingly non-hairy bottom. How this was inspiration for Chet to look happy is left to the imagination. With Baya Voce, Ryan's advice was only to the camera and not to her directly. She had auditioned for the Hip Hop Conservatory but she had declined the acceptance. Ryan wasn't aware of that and had previously asked Baya when she was going to start. Baya explained that their instructional style seemed similar to that of the military and it was not for her, so she decided not to join. Ryan wasn't happy about it because his philosophy is never to quit and to prove to yourself that you can do things you thought you couldn't. He mentioned that the military doesn't allow you to quit and that's a good thing. He thought that Baya had a history of giving up, so he said about her, "Somebody needs to slap her! And like [tell her] Baya! Work! Harder!" Three things about Ryan's harsh assessment of Baya: 1) you can tell in his eyes that he is saying what he is saying not because he looks down on her, but rather because he cares about her and her future. 2) Ryan forgets that when he said that the military is not for everyone, that also means that their instructional and motivational styles are definitely not for everyone either. 3) Ryan has only tried a few things in life and they are things that he found worthy of seeing through to the end. He hasn't discovered yet that in life sometimes you need to try different things and if they don't work out you need to stop and try something new instead. Most non-surprising moment of the episode: Chet summarized his life and career by saying, "I feel like I am a celebrity in my own mind. And it's a good feeling." Would that we all could travel to that alternate universe that is Chet's mind and bask in our own imaginary greatness.